It’s family movie night! Finally, you’ve got the whole family together for movie night — now all you have to do is keep them all equally entertained (despite their age ranges and interests!) for the next few hours. Hmm.. Not as easy as it seems? Don’t sweat it. 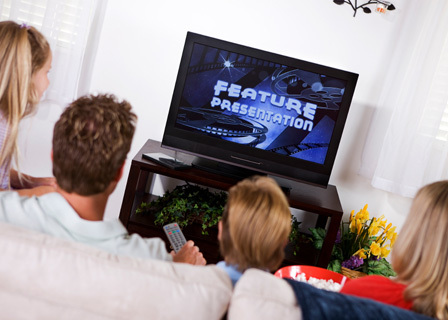 We’ve got some great tips to help you choose family movie night movies that everyone will love. Whether you’ve got boys or girls, toddlers or teens, or anything in between, there are definitely movies out there that can appeal to your entire audience, believe it or not. My 3-year-old was just cracking up during the “potty scene” in Alvin and The Chipmunks, The Sweakquel. Meanwhile, I was diggin’ the Chipettes version of Katy Perry’s “Hot ‘N Cold”. Okay, bad example. My point is, family movies today aim to please everyone in the family, so it’s likely you will be able to find something that everyone will like. And I’m not talking Friday the 13th scary. If you have younger kids, avoid movies that have scenes that might frighten or confuse them with topics they are not prepared to understand. Finding Nemo seems like a great flick for the whole family. After all, who doesn’t love Ellen DeGeneres’ delightfully addicting character Dory, who just can’t seem to remember a thing? However, themes of death (Marlin losing his wife and nearly his entire family in the opening scene) and getting lost from your parent (as Nemo does) could leave little ones confused. Mom Jennifer said her 4-year-old son asked her to turn off the flick once the fish in the tank wanted to “initiate” Nemo into “Tankhood.” Cute if you’re 10. Scary if you’re four. Outside of the movie selection, make movie night one your whole family will anticipate, even if it’s not their turn to pick the flick. Cruise the dollar store for microwave popcorn and movie-theater concession favorites that will make movie night a real treat for the whole family. To the internet! Arm yourself with some top-selection ideas before your and your family head to the movie store (or order a flick online). A simple Google search can help you narrow new releases, or check in with your local movie store to reserve an in-demand flick so your brood won’t be disappointed to find it’s gone before you get there. Family films like the Shrek series are great because the sense of humor (c’mon, Eddie Murphy!) appeals to adults, big names like Mike Myers and Cameron Diaz appeals to teens/tweens and the cute characters like Donkey and Puss in Boots will make your little ones smile. Develop a system that works for your family and allows every member to get a chance to select the movie. Whether by taking turns, taking a vote or allowing the members of your family to make a top-three list of movies they want to see, then making a final selection that’s appropriate for everyone based on everyone’s “top threes,” it’s important to help the members in your family feel vested in the decision. Don’t be the dictator of decision-making, but ultimately you’ll need to okay the final selection. Most parents might be surprised to find that even some family movies are rated PG-13.